Take refined flour in a mixing bowl, add semolina, pepper powder, salt and sufficient water to semi stiff dough. Add 2 tbsps oil and knead again. Cover with a damp cloth and set aside for 15 minutes. For the stuffing, put French beans, green peas, fresh coconut, potatoes, salt, ginger-green chilli paste, garam masala powder, coriander leaves in another bowl, mix well and mash everything together. Divide the dough into two equal portions and roll out each portion into thin chapattis. Spread the vegetable mixture evenly on each chapatti. Roll them tightly into cylinders and seal the two opposite ends. Keep the rolls in the refrigerator for some time. Heat sufficient oil in a kadai. Cut the cylinders into half inch pieces. 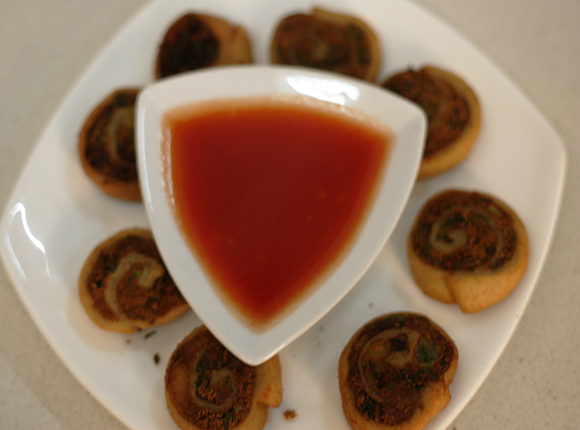 Arrange them on a serving platter and serve hot with green chutney.